As investors we cannot generally control the prices of the assets we invest in. We can control only two things: our risk exposure and the costs we incur. All else being equal, minimizing these ensures better returns. With this in mind, below is a list, New Year's resolutions as it were, of things we can all do to limit our costs and our risks. The list is compiled from my own mistakes and those I've observed others making. I've mentioned some of these before in previous posts. They may seem obvious, but time and again we see smart people make silly mistakes. 1. Are you overpaying for a service? If you can do the same thing at an equally reputable broker for less than at your current broker, why wouldn't you? 2. Limit the commissions you pay as a percentage of your investment to as little as possible. If you pay $10 in commissions to buy $250 worth of stock, for example, your stock has to go up 8% for you to break even. In other words, you pay $10 to buy and $10 to sell. Your position has to appreciate $20 in value for you not to lose any money when you sell. 3. Are you paying an account maintenance fee? Why? There are plenty of equivalent institutions that don't charge fees. If your IRA has a fee, switch to one that doesn't. If your bank account charges you fees, get a new bank account that offers the same features and is free. 4. If you invest in an index mutual fund or ETF, is there another index fund that is basically the same but charges less fees? In most cases there is. Most Vanguard products, for instance, charge less fees than competitors. So if you're using a competitor's products, you might be overpaying. For example, why pay 0.2% in fees with the iShares Total Market ETF (IYY) when you can pay 0.07% for a similar fund with Vanguard (VTI)? Granted that in real terms the difference is negligible and for small amounts probably unnoticeable, but the iShares ETF is almost three times as expensive for pretty much the same thing. With other funds, such as bond funds, where yields are important, the fund fee can take a big chunk out of your returns. For mutual funds, avoid funds that charge you fees for buying and selling. There are plenty of mutual funds out there with similar strategies that don't charge any transaction fees. For example, why go with a growth stock mutual fund that charges a 3.5% load when you buy when you can get a growth stock mutual fund that doesn't charge you anything to buy it? With that second mutual fund you are 3.5% ahead of the first one right away. 5. Do you subscribe to publications that you can read for free on the internet, or that you may already be paying for? Is the cost of the physical product worth it? 1. Never invest in something (stock, house, bond, art, etc) just because someone else says it's a good idea. It doesn't matter if it's a newsletter, a guru, someone on TV, a family member, etc. The person's track record doesn't matter either. You must do your own homework. This homework does not involve reading or inquiring about others' opinions on the investment, although these are good for confirmation and to get ideas. It involves, rather, forming your own opinion based on facts. For example, if an analyst says XYZ will earn $4 per share next quarter, take that as an opinion. If XYZ announces that it was awarded a new contract valued at $x, take that as a fact. 2. If you give your money to someone else to invest for you (mutual fund, portfolio manager, hedge fund, etc), make sure you understand their strategy. If necessary, have someone explain it to you. Never give your money to someone else because you don't understand or their strategy is too complex for you. If you can't understand the strategy, on what basis do you think investing with that particular manager is a good idea? While track records are good indicators, past performance does not equal future success, and past performance can be fabricated. You should only entrust your money to others when you understand the strategy and having someone else implement it for you is cheaper/less time consuming than doing it yourself. 3. Never keep your assets in one place. This includes a single money manager, a single institution, and a single asset class. That is, don't keep all your investments in one fund; don't keep all your cash at one bank (or in one place, like in your house); don't own only stocks (or bonds, or commodities, etc), and among each asset class don't only own one (real property is probably the only acceptable exception). If you invest in your employer (e.g., you can buy stock at a discount or are given shares as compensation), do so as little as possible. If your employer prospers, it's true that you won't participate in the appreciation of its stock price, but you'll be more likely to keep your job and maybe get a raise or bonus (the company is doing well, right?) If your employer experiences problems, you face a greater chance of losing your job and your investment will suffer. If your employer goes out of business, not only will you lose your job, you'll also lose your investment. Think of Bear Stearns and Lehman Brothers. Don't invest where you work, unless it's your own business. If it's your own business, make sure to invest in other places just in case something goes wrong. 4. Don't keep more in any account than you are insured against. For example, don't keep more than the FDIC limit at your bank. Don't keep more at your broker than insurance protects. 5. Limit your losses. After a certain point, it can take a very long time to recoup losses. For example, suppose you own stock XYZ, which has lost 30% in value since you bought it. For you to break even, XYZ has to go up 42.85%. If you've lost 50%, as another example, you have to gain 100% to get back to even. There are different reasons for selling a stock. Chief among them is whether you think the money will earn a better return elsewhere. If you have a losing stock but think that it has the best chance, among all other options, of growing your money, by all means don't sell. Put differently, if you'd buy the losing stock today (for valid reasons--not a pure gamble), there's no reason to sell. 6. When you decide to invest in something, say a stock, have a plan and a reason for buying. Why are you buying the stock? Why now? When will you sell? It's an interesting psychological phenomenon, as soon as we find a stock we think is a good investment most of us want to buy it right away. Never rush to buy anything. If it's a good deal today, it probably will be tomorrow. If you find a stock you like, don't chase it. Let it come to you for the price you want to pay. Remember, if it gets away, you don't lose any money, and every day offers new opportunities. One thing to consider here is writing (selling) cash secured puts. A put is a contract that gives the buyer of the contract the right to sell the writer of the contract an asset for a certain price within a certain time. Puts generally go up in value when their underlying asset falls in value (one can use puts instead of shorting stocks). Let's use Boeing (BA) as an example. Say you want to buy 100 shares of BA stock, which is currently trading around $40.53 a share (last close). And let's say you want to buy it now. Unless you have some sort of timing system that tells you when to buy your stocks, there's no reason to act immediately. But let's say you feel you must.Your total cost, if you buy the stock now will be $4053 plus whatever you pay your broker. One way to minimize your downside risk is to sell 1 put on the stock, say a month or two out, at the strike price you want to buy the stock, in this case $40. Selling the February 2009 put at the 40 strike will place around $320 into your account, minus broker commissions. If BA trades under $40 a share between now and when the put expires on February 20, 2009, your put will be exercised and you'll get 100 BA shares for $4,000. 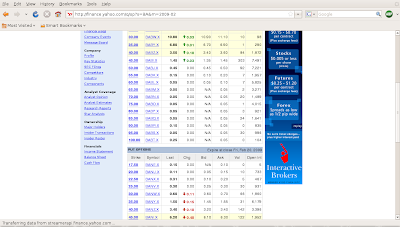 Since you were paid $320 for the put, your total cost for the 100 shares is $3680, plus broker fees. It's as if you paid $36.80 per share (will be slightly more because of broker fees). Had you bought BA in the regular way, for $40.53 a share, and the stock went down, you'd be losing money. Using the put to buy the shares, on the other hand, unless BA goes under $36.80, you don't lose any money. Now, let's say you were correct that BA would go up. The stock has to go up over $43.73 between the time you would have bought and when the put expires for buying the stock outright to be better than using the put strategy. In short, if you want to buy a stock right away, for no reason other than you just discovered the stock, sell a put for each 100 shares you want to buy at the strike price at which you'd buy the stock anyway. You either get the stock for the price you wanted plus a cash bonus, or you are compensated for the lost opportunity if the stock gets away. In this case, you make almost 8% if BA gets away from you. 7. Just as you shouldn't chase a stock on the way up, don't chase it on the way down. The only way one can buy a stock at the bottom is through luck. While selling puts is one way to avoid risk, doing so in a bear market comes with its own risks. That is, stocks can fall much farther and faster than you anticipate. While selling puts can offset your losses, it may be harder to get out of your positions and may lead you to incur more losses than if you simply bought the stock in the regular way and sold it. *Some may find a contradiction between what I say here and what I've written in the past (here, here, here and here) on owning dividend paying stocks forever. I don't believe there is one, but as this post is already too long (I didn't have time to write a shorter one), I'll leave that for another day.